What is Dutch elm disease? Dutch elm disease is a lethal fungal disease of native North American elms. The fungi that cause Dutch elm disease entered the United States early in the 1900’s on elm logs from Europe. 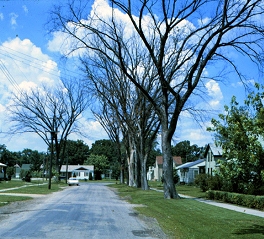 Dutch elm disease now occurs throughout the U.S. and has led to the loss of the American elm as the premier street tree. Dutch elm disease has led to the loss of the American elm as a street tree. What does Dutch elm disease look like? Wilting leaves, often on a single branch, are the first symptoms of Dutch elm disease. Yellowing of leaves and leaf drop follow. Trees may quickly lose all of their leaves, or trees may survive several years with an infection localized in a single branch. Infected branches often have brown streaks under the bark that follow the wood grain. Where does Dutch elm disease come from? Dutch elm disease is caused by two fungi, Ophiostoma ulmi and Ophiostoma novo-ulmi. These fungi are moved from tree to tree by two species of elm bark beetles that breed in elm trees, by root grafts that form between roots of adjacent elm trees, and by human activities such as pruning. How do I save a tree with Dutch elm disease? Total removal of infected elms is the preferred method of managing Dutch elm disease. Prior to removal, disrupt root grafts between infected elms and other nearby elms. Destroy wood from diseased elms by burning or burying. If you decide to keep the wood, remove the bark, then pile the wood in one place and cover it with a heavy tarp, burying the tarp edges with soil, until the wood is used. If you decide not to cut down an infected elm, remove, then bury or burn, dead or dying branches. Make cuts six feet below the area showing symptoms. Disinfect cutting tools between each cut by dipping them for at least 30 seconds in a 10% bleach solution or alcohol (spray disinfectants that contain at least 70% alcohol can also be used). Injections of propiconazole or thiabendazole are often recommended as preventative treatments for infected elms. Unfortunately there is only limited unbiased research to indicate exactly how effective such treatments are. How do I avoid problems with Dutch elm disease in the future? Plant non-native hybrid elms, such as “Accolade”, “New Horizon”, “Regal” and “Frontier”, that are resistant to Dutch elm disease. Dutch elm disease resistant varieties of American elms are also currently available. Look for varieties such as “American Liberty”, “Independence”, “Princeton”, “New Harmony” and “Valley Forge” at your local nursery or garden center. For more information on Dutch elm disease: See UW-Extension Bulletin A2392, or contact your county Extension agent. Thanks to Lis Friemoth, Ann Joy and Laura Jull for reviewing this document.